A specially written ballet has been performed in Milan to mark the 10th anniversary of fashion designer Gianni Versace's death. Thanks Gianni, With Love was put together by French choreographer Maurice Bejart, for whom Versace designed many stage costumes. About 1,500 guests, including Versace's favourite models, attended the show at the La Scala opera house. The designer was murdered outside his Miami mansion on 15 July, 1997. 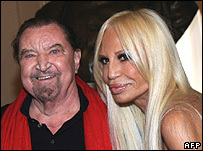 His sister and muse Donatella, who took over the Versace fashion empire, created several costumes for the ballet. "It is the most beautiful gift I could do for him," she said. "He was a genius and a simple exhibition of his designs would have been banal. "Fashion wasn't enough for him, he also loved art, music, history and dance." Bejart, 80, worked with Versace on a dozen ballets from 1984 until the designer's tragic death. Shortly after his death, he described his friend as a "true artisan" and compared him to the "great creators of the Renaissance - always on a quest for novelty and beauty". Bejart's two-part tribute, known as Grazie Gianni con Amore in Italian, paid homage to the shows he designed with Versace, including Barocco Bel Canto and La Mort Subite (Sudden Death). Guests at the gala performance included supermodel Claudia Schiffer, designer Karl Lagerfeld and actress Liz Hurley, who became famous for wearing a Versace-designed black dress held together with safety pins. 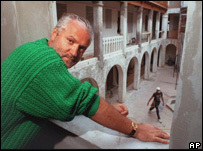 Gianni Versace was born on 2 December 1946 in the industrial town of Reggio di Calabria in southern Italy. He started designing clothes at the age of 22, and built his fashion empire from a studio in the centre of Milan. His 1982 collection introduced metallic garments that would become his trademark, and his elaborate stage costumes for Elton John in the late 1980s helped cement his reputation. The designer was gunned down outside his Miami Beach home by Andrew Cunanan in 1997. Cunanan was later found dead. Other events scheduled to mark the anniversary of Versace's death include an exhibition of his sketches of theatre costumes on the streets of Milan and the establishment of a scholarship at the European Institute of Design.